Currently Tiffany lives in Seattle and is working on a novel and a second poetry collection. 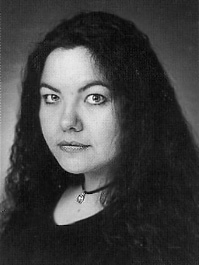 Tiffany received the Diane Decorah Award for Poetry in 1994 from the Native Writers' Circle of the Americas. Guiding the Stars to Their Campfire, Driving the Salmon to Their Beds , Gazoobi Tales. To purchase this chapbook, contact Tiffany..
Outlaws, Renegades and Saints : Diary of a Mixed-Up Halfbreed , Greenfield Review Press. Animal Lore and Legend : Buffalo , Scholastic Trade. A Shade of Spring (7th Generation Books), Florene Belmore (Editor), 1998. The Poem and the World: The Seattle Sister Cities Poetry Anthologies , Volume 4, 1998. Blue Mesa Review , Vol. 6, David Johnson (Editor), Univ of New Mexico Press. Ergo! : The Bumbershoot 1994 Literary Magazine , Bumbershoot. This is an "official" site in that this page was constructed with the assistance and active collaboration of the poet, Tiffany Midge. The website "author" is Karen M. Strom. © 1997 Tiffany Midge and Karen Strom.